After a long wait, Paramount Pictures finally delivered our best look yet at Star Trek Beyond last night – releasing the movie’s brand new trailer. This footage released was timed to correspond with a special Star Trek Fan Event held in Los Angeles, which played the promo clip on a screen in one of the vast soundstages on the Paramount Lot. That wasn’t the only preview of the film that fans got, however, as the film also delivered extended looks at three of the movie’s key early sequences. I was on the ground at the Star Trek Fan Event last night, and walked away not only knowing a lot more about Star Trek Beyond, but also quite impressed with all of the footage that was shown. Read on for not only a full description of the material that was shown, but our thoughts and feelings on it! Of all the footage that was shown to us, it was a clip from what I can only presume is the opening of the film that truly has me optimistic about Star Trek Beyond. Unlike the first two movies, it harkens back to the classic opening of the television series: Kirk recording his captain’s log. The clip began with the Enterprise softly gliding through space, with the voice of Chris Pine’s Captain James T. Kirk opening his log entry revealing that it is Star Date 2263.45, and that the crew is celebrating the third year of their five year mission. Unfortunately, this time floating through space is taking its toll on everyone, as it’s particularly hard to figure out "where one day ends and another begins" – illustrated with Kirk going into his closet and seeing nothing but a row of yellow uniforms. After watching Kirk go through his morning routine, he and a mug of coffee make their way out to the deck of the Enterprise, where everyone is already hard at work in their various positions. Kirk’s voice-over notes the importance of making the ship feel like home as the camera pans over Sulu (John Cho), who has a photo of his young daughter taped to the control panel in front of him. As the voice-over speaks to the stress that the mission has put on the ship, we get a glimpse into the engineering department, where we see Scotty (Simon Pegg) and Keenser (Deep Roy) futzing around. The footage then follows through the halls of the Enterprise, watching young uniformed male and female crewmates catching eyes. 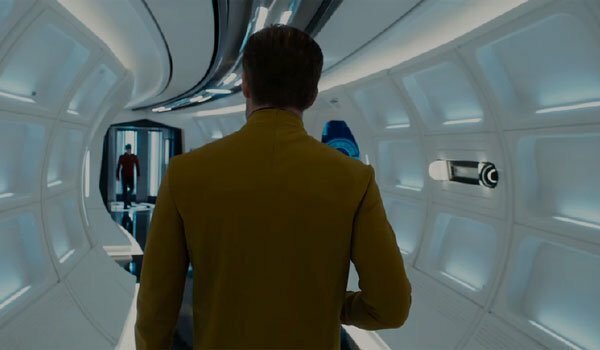 As the scene spills into montage, Kirk notes that this is a pretty natural thing, but it has its up-sides - cut to two young crewmembers kissing in a room - and down-sides - cut to an alien crewmember kicking out a half dressed Chekov (Anton Yelchin). Cutting back to the deck, we see Kirk getting comfortable in his captain’s chair, but the voice-over admits that the day-to-day has become episodic, and that repetition and boredom has led to questioning exactly what it is that they’re doing on the mission. The clip ends as the Enterprise sails towards what’s been reported to be the Starbase Yorktown. This Star Trek Beyond clip did a fantastic job setting a tone for the movie it’s in front of, and it’s exactly the tone that you want from Star Trek. While Captain Kirk may be getting a bit restless, it still featured a sense of needed optimism that will hopefully be featured throughout the rest of the film. 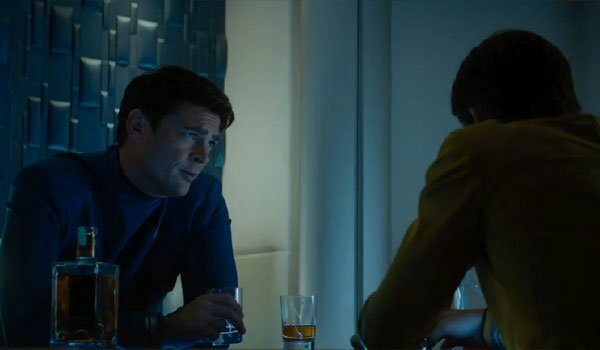 Kirk and Leonard ‘Bones’ McCoy (Karl Urban) were among the first two future crew members of the Enterprise to meet each other in the J.J. Abrams Star Trek universe, and the second clip shown from Star Trek Beyond capitalized on that bond. We learned from the Fan Event that Bones will actually be paired with Zachary Quinto’s Spock for a large portion of the film, while Kirk will be with Chekov, but the movie still found a moment for the old friends. The scene started with Kirk looking glum at the bar and drinking alone, an odd shaped bottle of dark liquid next to his arm. Bones comes in apologizing for being late, providing an excuse about Keenser being sick and leaking corrosive liquids. Making his way to the opposite side of the bar, the doctor questions the captain about what he’s drinking – which Kirk reveals is leftover Saurian Brandy (a callback to many episodes of the various television shows). Bones objects to this, warning that his friend is going to go blind, and instead whips out a bottle of 30 year scotch. McCoy admits that he stole it out of Chekov’s locker, and the friends muse about the surprise that it wasn’t vodka. It turns out that the third year of the five year mission isn’t the only big anniversary happening on the ship, as Bones recalls that Kirk’s birthday is coming up. This is kind of a sore subject for the captain; however, as fans will remember that in this universe he was born on the same day that his father was killed in a battle with Nero. In conversation, Bones approaches this subject rather bluntly, which gives Kirk opportunity to retort, "Did they teach you about bedside manner?" The clink glasses and drink – both simultaneously wincing and commenting on how good it is. Refusing to let the subject go, Bones inquires if his friend his going to call his mom on the day – which gives Kirk pause, given that he is now one year older than his father ever was. As heard in the trailer, he then muses on his dad’s legacy in Star Fleet, noting that he had noble intentions within the organization while Kirk had just joined on a dare. Bones responds that the captain has just spent his entire life looking up to George Kirk, and that now he needs to be his own man. He then raises a glass, saying, "To perfect eyesight and a full head of hair." As they once again drink, the captain asks the doctor to keep his birthday under wraps – to which Bones responds, "You know me, Mr. Sensitive." Knowing that Star Trek Beyond will separate these two characters for a considerable amount of screentime, it’s nice to see them have this moment here, and it’s an entertaining scene. Chris Pine and Karl Urban have always had good chemistry together, and Simon Pegg’s script has the right amount of humor to keep some lightness in a serious conversation. After two dialogue-heavy scenes, the Star Trek Beyond footage wasn’t ready to let fans go without a bigger taste of what the film has in store action-wise. It’s previewed in the trailer, but we got to watch an extended version of the sequence where the Enterprise is destroyed in a destructive hail of ships attacking as an unstoppable swarm. The footage began with no real context for exactly what’s going on in the scene – but that really just succeeds in making it all the freakier. The crew on the Enterprise is completely baffled by what is attacking them or how to defend themselves, so Kirk calls for Sulu to warp them out of the situation – but this proves to be a failed maneuver, as the drive can’t be engaged. Outside the ships continue to absolutely pummel the famous star vessel, and everyone from the front deck to engineering is in full-blown panic. 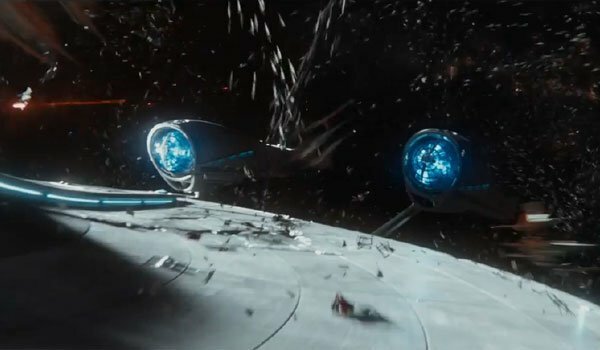 As the footage cut more into montage mode (likely because the sequence hasn’t been entirely completed just yet), we got to watch sequences of Krall (Idris Elba) boarding the Enterprise, Kirk calling for everyone to abandon ship, the engines being completely blown off, and Scotty narrowly escaping a face-to-face meet with Star Trek Beyond’s central villain. The crashing Enterprise winds up finding itself caught in the gravity of a nearby planet, and Chekov assists others getting to their pods before launching himself. We see Sulu get away in a pod by himself, but midflight we see him get slammed by part of the swarm. Because we hadn’t seen them spend any time together in the clips to that point, the footage concluded with a scene of Kirk and Spock coming together, with Kirk saying, "We make a good team," and his friend retorting, "I believe we do." After the controversial first trailer for Star Trek Beyond that was released all the way back in December, I have to admit to being a bit wary about the blockbuster. This footage helped push me in the complete opposite direction. It was fun, thrilling, and managed to squeeze in some good character work in a short amount of time. Of course, it should be recognized that this footage was obviously put together to make the movie look as good as possible and build buzz, but I also can’t say that it didn’t do just that. Stay tuned for more from our time at the Star Trek Fan Event, and look for Star Trek Beyond in theaters on July 22nd.